The Ford F-150 is a two-door, three passenger full-size pickup, and a four-door, five to six passenger full-size pickup. The Ford F-150 has been the best selling vehicle in North America for decades. This rugged, stylish and above all functional pickup truck has long embodied each of the qualities that a truck buyer is looking for: power, towing capacity, cargo space and excellent driving characteristics. Ford has built their entire product lineup around the F-150, and it is their flagship vehicle both in the United States and around the world. Now in its eleventh generation, the 2008 Ford F-150 still bears the appearance of the new platform which appeared in 2004. The truck displays a square shape with rounded edges, more muscular than the vehicle it replaced and with a greater feeling of size and power. Under the hood, buyers can choose from one of three options. For basic trucks, a 4.2 liter, 202 horsepower V6 gets the ball rolling. The next step up on the performance ladder is a 4.6 liter V8 which generates close to 250 horsepower and almost 300 lb-ft of torque. The apex of power for standard F-150’s is the 5.4 liter Triton V8 which is shared with the Expedition and which makes 300 horsepower and 365 lb-ft of torque. The V6 can be had with either a 4-speed automatic or a 5-speed manual transmission, while each of the V8 options is available only with the automatic. Although engine choices may be fairly simple, deciding which version of the F150 to order is not. There are 10 different trim levels available for the F-150, which is enough to confuse even the most devoted pickup fanatic. In order of comfort and amount of standard features, they are the XL, STX, XLT, FX2 Sport, FX4, Lariat, King Ranch, Lariat Limited and the two special edition versions of the pickup, the Harley-Davidson and the 60th Anniversary Edition. The XL is aimed at those who want to use their trucks for basic hauling and work-related tasks, while moving up the line introduces a number of different suspension, interior and performance upgrades. The aptly named King Ranch is a veritable living room on wheels, with a sumptuous interior and excellent driving comfort. The Harley-Davidson edition of the truck bears a special two-tone paint scheme, enormous 22-inch wheels, a performance-tuned suspension and Harley-Davison badging. The F-150 can also be ordered with 5 different wheelbases in order to accommodate a variety of different box lengths and cab configurations. Of course, the F-150 is available with 4-wheel drive and is suitable for off-road pursuits as well as towing. When outfitted with the 5.4 liter V8, towing capacity is an impressive 9,500 lbs. Even V6 versions of the truck can haul as much as 5,700 lbs. In terms of driving characteristics, with so many different suspension configurations it is hard to characterize the vehicle to any specific degree other than to say that the harsher suspensions are more than adequate for handling heavy loads and the more comfortable editions are acceptable for what one would expect from a pickup truck. Acceleration is brisk, but not exceptional – the F-150 is a heavy vehicle, and in comparison to some of its higher-tech competition, does not have the legs required to keep up. However, with a re-design right around the corner, there is no doubt that the 2009 F-150 will be more than up to the task of continuing on as the industry standard for pickup trucks. The 2009 Ford F-150 has been completely re-designed. The new generation of truck has been updated to include a stiffer frame and lighter curb weight along with a larger interior and higher towing capacity. The exterior has also been completely refreshed and adopts a more angular appearance than the outgoing model. A number of mechanical upgrades and changes have been made as well. There are seven different trim levels available for the F-150: the XL, STX, XLT, FX4, Lariat, King Ranch and the Platinum. The Platinum trim level provides as many standard and luxury features as would typically be found in a premium sedan. The first three come equipped with a 4.6 liter V8 engine that produces 248 horsepower and 294 lb-ft of torque. This engine’s fuel economy is rated at 14 miles per gallon in the city and 19 miles per gallon on the highway. A 4-speed automatic is standard equipment. A more powerful version of this motor that uses 3 valves per cylinder in order to provide better breathing is optional on each of these trims, and it bumps production up to 292 horsepower and 320 lb-ft of torque. Fuel mileage is also improved to 15 miles per gallon in stop and go driving and 20 miles per gallon on the highway. This engine is matched with a 6-speed automatic. All other editions of the F-150 come with a 310 horsepower, 5.4 liter V8 engine that also churns out 365 lb-ft of torque. The motor can be run on E85 Flex Fuel and produces slightly better power numbers when using ethanol. It also uses a 6-speed automatic to handle gear changes. On gasoline, the 5.4 liter engine turns in fuel economy numbers of 14 miles per gallon in the city and 19 miles per gallon in highway cruising. Each truck can be had with four-wheel drive. 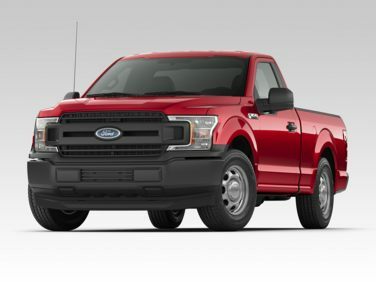 A towing package is optional on the XL through XLT trims but is standard on all others, and when equipped with the 5.4 liter V8 and a long wheelbase the 2009 Ford F-150 can tow up to 11,500 lbs. A Max towing package is also available.